"And we made from water every living thing"
That really is a very beautiful building! And a good verse to match it, too! Very beautiful architecture ,nice work. it is a pity that the architecture of today is not at the same level. Very nice building, I'm surprised at how clean it is, in contrast to Al-Abed building. I guess it's the abundance of water! I think that everyone who visits this blog knows that Damascus is truly a beautiful capital city and has some amazing history, culture and architecture like this building here. This book is about $100/£50 and is avilable from good e-tailers like amazon. 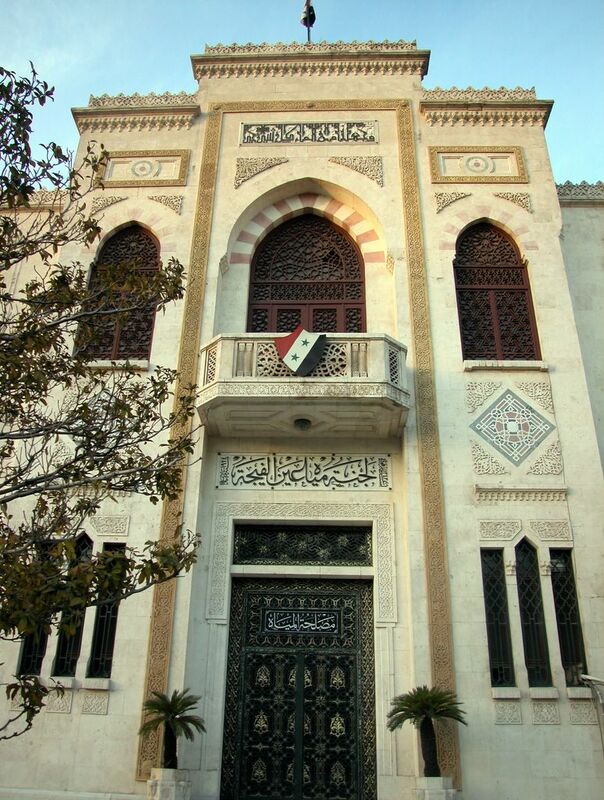 It is about the art & architecture of Damascus and has photos, charts, architectural plans and other useful things. Gerard Degeorge has also written a 3 VOLUME history of Damascus but I think that unfortunately it is written only in French as this chap is French. Degeorge is actually a scrupulous historian and his academic writings can be a bit overwhelming but he is an expert in Islamic art and architecture having also published books on Islamic tiles and the Islamic art and architecture of Samarkand, Bukhara and Khiva in modern day Uzbekistan! Faraz, thanx for posting the book Damascus, I wanna add a little note that the book is also available on www.amazon.com for $59.85 which is a lot cheaper than $100.00 for those interested, Amazon.com is very secure, I've already purchased a few times from them. it's still sorta expensive..! In fact there is another excellent & fascinating book on Islamic art and architecture which covers the WHOLE Muslim world: Morocco, Egypt, Turkey, Syria, Iran, India, Malaysia/Indonesia, Central Asia etc. The price on amazon.co.uk after a discount is £17.49 - a very good price for a comprehensive book with excellent photographs and writing/commentary! Thanks for the info, Faraz. I didn't know about this book before.